It's time to get seriously shredded! Celebrity trainer and national bikini competitor Autumn Calabrese has combined simple eating with extreme fitness to help people shred up and shed off those final pounds with 21 Day Fix EXTREME. 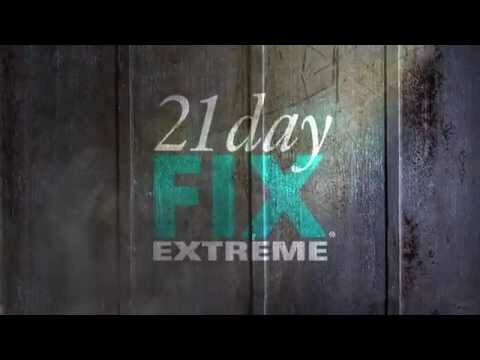 What makes 21 Day Fix Extreme Unique? No other program has you eating this well and working this hard. It's going to take guts, intensity, and drive. But it's only 21 days. For your nutrition, you'll not only be practicing portion control—you'll be eating ONLY clean foods. No treats. No cheats. No excuses. Who is 21 Day Fix Extreme Good For? individuals looking for a dramatic short-term weight-loss deadline, or need a final push to achieve the hardbody they've always wanted. but want to get shredded and have defined abs. Now there's an easy-to-follow nutrition and fitness program that makes losing weight so simple, you can lose up to 15 pounds in just 21 days! Get beach-ready for a vacation, look drop-dead great at your upcoming reunion, or simply jump-start a major weight-loss goal—with the 21 Day Fix and Shakeology Challenge Pack. You'll do one 30-minute high-intensity workout per day..
After 21 days of extreme fitness and clean nutrition…you're going to have some serious results. If you want something in your life you never had, you have to do something you've never done! 30 days from now you'll wish you started today! preparation equals success. Plan your meals. You can't out train a bad diet! Buy 21 Day Fix Extreme NOW!